Matthew Carr writes: I’m secure enough to know what I can and can’t do. But a longtime friend is always telling me about his plans to remodel his home. That he’s going to take down a wall or put in a new set of cabinets or build some piece of furniture. I used to ask, “Who’s your contractor?” (Because finding a good contractor is nearly impossible.) But I stopped asking after hearing, for the umpteenth time, that he’d be doing the project himself. Every time, he starts with promise... full of ambition and gumption... only to wind up having to call someone to fix the mess he created. Me, on the other hand? I’m honest with myself. I know I don’t have any skills when it comes to carpentry or electrical work... or gardening... or pretty much any endeavor that would require competent use of power tools. But it’s mainly the season of do-it-yourself. This investment trend spans a number of sectors, but mostly falls within home improvement and automotive. I’m not a DIYer. I’m more what you’d call a DIFMer (do-it-for-me). But I’ll show you how DIY and DIFM customers are both feeding this trend. And most retailers have to contend with the DIYers and DIFMers. Summer is the time when people traditionally like to work on their cars. There’s that classic movie image of some dude in a sleeveless shirt blasting Def Leppard as he tinkers away on his Trans-Am in the driveway. Of course, you know at some point he’s going to have to run off to the auto parts store to pick up a flux capacitor or infinity drive or some other mechanical thing I don’t understand. 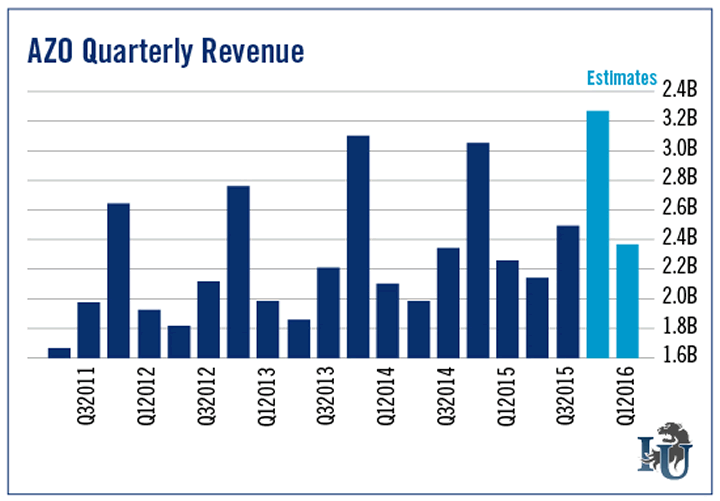 For auto parts retailers, it’s largely been a solid 2015 - as well as a strong past 12 months. Shares of AutoZone (NYSE: AZO) are up roughly 10% year-to-date. For the full year, they’re up 28.3%, which is slightly better than competitors Advance Auto Parts (NYSE: AAP) and Monro Muffler Brake (Nasdaq: MNRO). Year-to-date, O’Reilly Auto Parts, AutoZone and Monro have left the broad markets in the dust, up 7% or more. Advance Auto Parts is the laggard in this group. But let me show you which quarters have the greatest impact on these companies - and their shareholders. 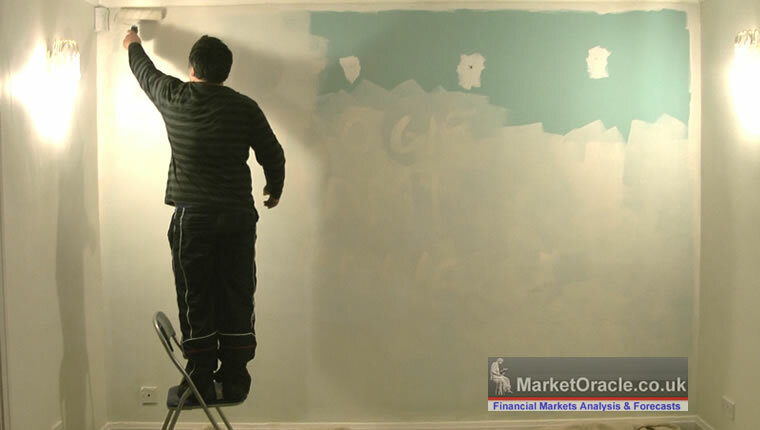 That way, so you can see the difference between DIY and DIFM spending. First, let’s look at Advance Auto Parts. Advance Auto Parts is the largest parts retailer in the United States. Every year, the first quarter - ending April 25 - is the standout. 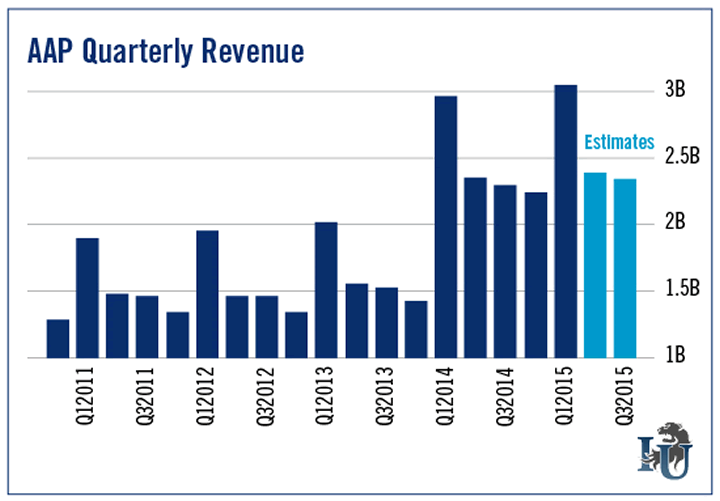 Sales increased 2.3% this year to $3.04 billion, largely driven by the addition of new stores. Shares had a nice pop on that report and are currently trading where they ended on May 21. AutoZone’s big quarter is its fourth quarter, which is currently underway. The company’s third quarter ended May 9. In its earnings release, AutoZone reported that revenue had increased 6.5% as same-store sales grew 2.3%. The second-largest retailer of aftermarket automotive parts in the country, AutoZone will report fourth quarter results in September. Why is Monro Muffler Brake so inappropriately named? Because only a tiny piece of its revenue actually comes from muffler and brake sales. The bulk (roughly 44%) comes from tire sales. And another 28% or so comes from maintenance - oil changes, state inspections, oil filters, scheduled maintenance, etc. In other words, DIFM work. 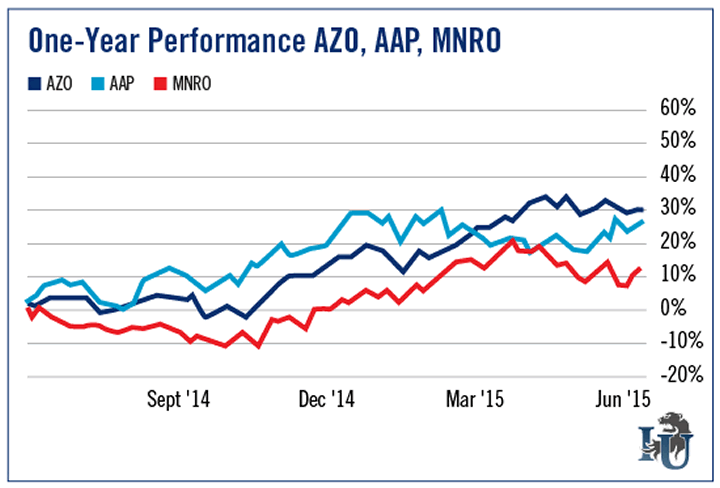 Which explains why Monro’s quarterly performance doesn’t look like that of Advance Auto Parts or AutoZone. 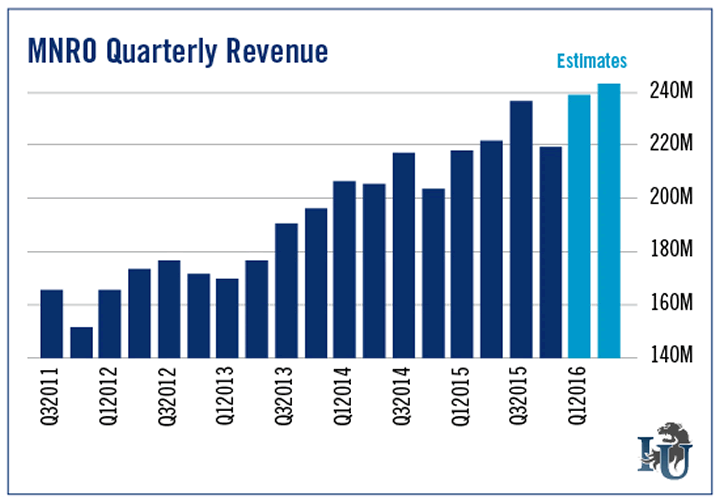 Its revenue moves up from the first quarter to the third quarter, with its fourth quarter - which we’re currently in - typically being its slowest. The U.S. automotive aftermarket industry represents about $246 billion annually. And of that, $197 billion is DIFM. But as of 2013, it had dwindled to 20.7%. This is why Advance Auto Parts purchased General Parts International. Prior to this acquisition, 60% of the company’s sales came from DIYers. But after, 57% of Advance Auto Parts’ sales came from the DIFM segment. In the commercial DIFM segment, AutoZone is a relatively small player. It owns about 2.8% of the current market. It’s still a hot spot for DIYers, though. And even though their numbers are dwindling, there are still more than enough to boost AutoZone’s summer sales. As the warmer weather creeps in, we all have projects we want to accomplish. Many of those will be automotive related. The Dow Jones Industrial Average is now negative for the year. As I wrote last week, if the index couldn’t hold 17,915, we might be in for something a little more dramatic... Sure enough, the blue chip index shed another 200 points before starting to tick higher. At the moment, we’re sitting just north of 18,000. But I don’t think we’ll stay here too long. We often see a summer lull in the markets. But it’s not across all sectors. Now is the time when DIY auto maintenance ramps up. So, smart investors, rev your engines.